Have there ever been two more contrasting Womads than the first two at its new, expansive home in the back garden of the Earl of Two-Counties (Suffolk and Berkshire, curiously) amongst the rolling hills of the Wiltshire countryside? No glutinous mud this year, no traipsing three miles to finally reach a sign that points you back in the direction whence you came, no un-briefed stewards and pitiful on-site communication. 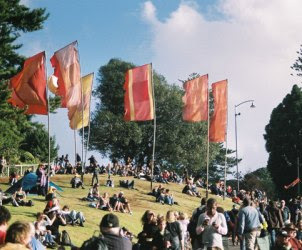 Womad is back, as sunny, friendly and ear-nose-and-stomach-nourishing as ever – in fact, now that the floods have cleared, we can finally see how much roomier, grassier, shadier and less dusty it is than the tired old Rivermead rec by the Thames. The Open Air (Main) Stage kicked off on Friday to the unfortunate sound of the Tashi Lhunpo Monks of Tibet’s reflective, reverential songs being backed by the heavy Cubano thud of the Rumberos de Cuba, who were sound-checking in the neighbouring Siam Tent. It was like all your worst Realworld new-age fusion nightmares had come to haunt the new site set-up. The problem never got quite as extreme as that again in my experience, but sound bleed from (and between) the three main stages was an issue for many, especially the patrons of the smaller Speakeasy and Little Italy stages; one of the few small wrinkles to iron out for next year. The Radio 3 Stage suffers no such problems, as it is sited away from the main arena amongst the lovely little glades and arboretums that house the various alternative therapy and “wellness” traders. This stage is where the lesser-spotted Womad Anyman can be found – fifty-something years young, grey-haired and bespectacled, these creatures park their spreading bottoms on folding chairs about three rows from the front, head buried impassively in their Guardian arts pages (am) or Dean Koontz novel (pm), stirring only to take a snap of each artist for the photo album. Such serenity in the face of polyrhythm was severely tested this year by the Bedouin Jerry Can Band. There's something about their name that seems to imply novelty - they use jerry cans (or jerkans as they call them) and ammunition boxes as percussion in addition to the traditional frame drum, flutes, simsimiyya and wolf skin fiddle - but even though there's a lightness of touch to the music and a jollity to the delivery, there's genuine musical artistry there as well, and a fine sense of the role the music (and coffee making) plays in the Bedouin community of the Sinai desert in Egypt. Hips shook, heads nodded, and Friday was off to a stormer. Justin Adams has gone a considerable way towards filling the Strummer-sized hole that exists in the area where contemporary British rock music meets its past American influences and the music of the world today, and he’s found his Tymon Dogg in Gambian riti (single-string fiddle) player Juldeh Camara. They rocked the Radio 3 stage on Sunday with their Bo Diddley-meets-buzzsaw-violin, although clumsy scheduling had them up against last year’s festival darlings (and multi-World Music Award-winning) Bassekou Kouyate and Ngoni Ba, who once again proved themselves to be just about the grooviest band in the world today. Niger’s Malam Mamane Barka is trying (with a more traditional approach) to do for the biram what Bassekou has achieved with the ngoni, bringing the evocative sounds of the rarely seen 5-string harp-lute to a wider global audience. Judging by his impromptu performance in (and outside) the ever-excellent Taste the World tent (which surely needs no explanation), he has the charm and (more importantly) voice to pull that off, and will be back to beguile the UK again later in the year. Other African highlights included veteran Senegalese band Orchestra Baobab who performed a Sunday evening seduction on the Main Stage, although the real treat was to come an hour later as a stripped back version of the Afro-Cuban ensemble reprised three tunes for Charlie Gillett’s World on Three radio show. Gillett also showcased Zuzana Novak, an Anglo-Czech who qualifies as honorary African for her convincing study in Zimbabwean mbira thumb-piano music, and her solo set was a welcome encore to her performance at the admirably intimate (but sound-bleed afflicted) Saturday evening Speakeasy session. And Malian Mamani Keita looks finally to have begun building up the recognition she deserves for her excellent 2006 album with French guitarist/producer Nicolas Repac, their punchy Saturday afternoon Sicily Tent performance leading to a sell-out run on Yelema the next day. The strong African showing was arguably not reflected in other broad geographical areas. Eastern Europe and the Middle East seemed particularly badly served, although the little I caught of Serbian siren Svetlana Spajic’s set with the implausibly-talented British folkie Andrew Cronshaw seemed to suggest that I missed a real belter. Heart-stoppingly soulful vocals were also to be heard on the Sufi night session, with Uzbek vocalist Monajat Yulchieva every bit as sparsely affecting as fellow-Uzbeki Sevara Nazarkhan was enchanting a couple of Womads ago. Enchantment is Mor Karbasi’s game, particularly so at the Speakeasy session, backed by partner Joe Taylor. Astonishingly beautiful, with a stirring album of Sephardic songs receiving plaudits in all the right places, expectations were high for the UK-based Israeli’s performance in full ensemble (and multiple dress-changing) mode in the Siam Tent the previous day. The jury remains out on this one, the set being impressive without fully engaging, maybe the result of a performance that was almost too well-staged and deliberate. Sa Dingding from China also delivered a staged, costume-varying performance, ambitious in its theatricality but slightly disappointing in sound, her sweet, frail voice too often lost in the heavy, multi-instrumental mix. Shane MacGowan lost his voice years ago – in alcoholic mixers rather instrumental mixes – and as admiring I am of his timeless canon of London-Irish songs, his way-beyond-tiresome cartoon drunken Mick performance was an (albeit extremely well-received) blight to Sharon Shannon's ground-shaking Friday night ceilidh. From folk-based dance to the ragga-soul of Mista Savona - the Australian funkateers cooked up two horn-honkingly sweaty boogiesome sets to delight the under-30s (and many of we over-40s to boot), and I don’t think I’ve ever seen a younger Womadian age-group than that at the front of Main Stage for the Niles Rodgers self-tribute band masquerading as Chic (Rodgers-composed Sister Sledge songs in abundance) for their perfectly-judged showbizzy set that tapped right into the audience up-for-a-party mood. Contrastingly, Squeeze turned up, ran through an uninspiring greatest hits set and left having barely made a mark on the festival. The great Toumani Diabaté left a permanent mark on the Womad world when he was just a cherubic twenty-something kora ingénue, and he represents the durability of the unique event’s mark on its extended family. Performing on Friday evening in the Siam tent with a smaller, tighter Symmetric Orchestra than usual (the kitchen sink must have been held at customs), Toumani introduced his kora-playing son Sidike (who himself is barely out of his teens), local UK-based Senegalese friends Seckou Keita and Jali Fily Cissokho, and perhaps the greatest master Manding vocalist of them all, Kasse Mady Diabaté. Youth, experience, family, friends. And great music. A perfect summation of the essential elements that went into another great Womad weekend.